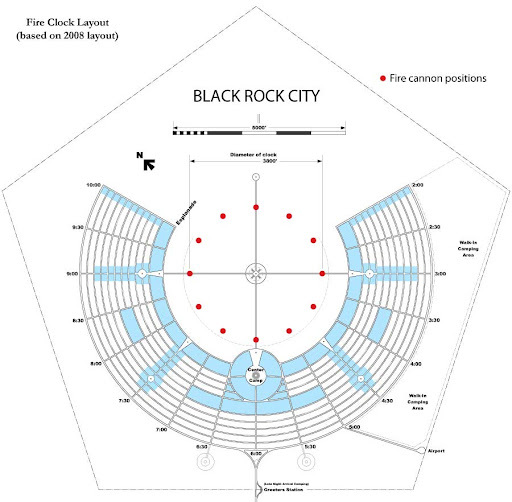 Twelve large flame effect devices arranged at the o’clock positions in a roughly 3800 foot diameter circle to give a time scale to the playa and create the largest clock face ever made. Every hour on the hour, from Monday until the burn, time can be discerned as each position fires off. At noon and midnight all twelve cannons go off simultaneously. How can you tell what time it is? Since people already associate the street positions with o’clock positions, this allows a universal spatial time reference. During the day people near enough to that o’clock position can see and hear the fire, people further away will see the rising ring of smoke. After dark, the flame effect and heat wave will be noticed across the whole playa. Everyone at Burning Man will be able to tell the hours of day or night, events can be planned around this universal playa time scale. We plan to achieve the flame effects with pneumatic sawdust puffers. (you can see a small scale one of these in action here in the embedded video below) I think the flame effects are comparable to the liquid flame throwers we have built in the past, yet the sawdust is vastly safer, more economical, and more ecologically sound to work with. Each o’clock position will have a device that can pneumatically shoot up about 60 pounds of ignited sawdust into the air making a 1000 foot tall effect. We want to give time to playa and its citizens. We think that by giving a temporal cadence to each day, the theme of evolution can be embraced as the maypole around which the whole event itself dances. 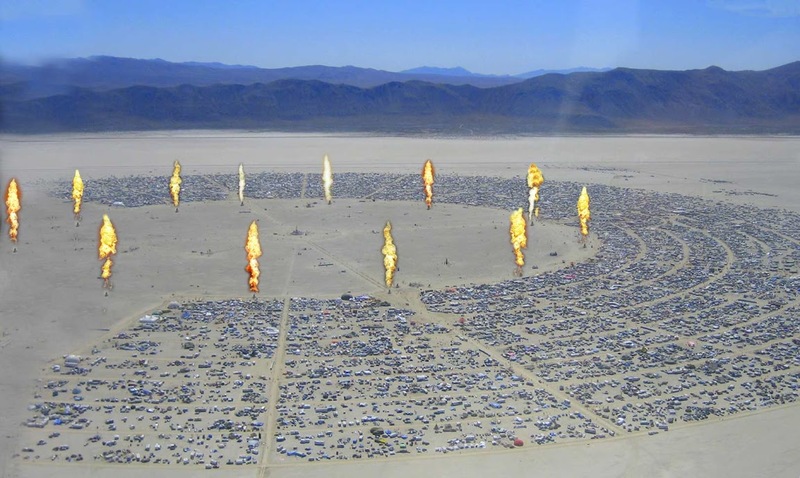 I have been attending Burning Man since 1996 and have done several large-scale projects including the ICP fire cannons, and my camp Antarctica. During all of those years my one disappointment was missing scheduled events – either because I was too wrapped up in another project, or like many participants, I was not wearing a watch. I have also spent the last 11 years designing and building a monument scale 10,000-year mechanical clock with The Long Now Foundation. This has given me a perspective on time, clocks, and the effect they can have on people. While I do not believe that the playa is a place for second by second accuracy, there are events that are scheduled, and more that could be, if there was only a universal temporal reference. I want to supply that reference and give the playa a rhythm for its heart to beat by. We will need a lot of help for this project and must recruit a set of people to help run the cannons for all the hours of the day. Four of the engineers who build the cannons will be the Quartermasters. Each of the Quartermasters will be in charge of three adjacent o’clock positions, or one quarter of the Clock’s face. Each one of the hour positions will be assigned a crew that will be trained ahead of the event, and will be led by an Hourmaster. Each Quartermaster and Hourmaster will be in radio contact with me. Each Hourteam will be responsible to keep a safe perimeter, shovel some more sawdust into the unit, light the pilot, actuate the valve, and then make the unit safe until its next use. Before each hour’s firing, the Hourteam will come to a consensus on safe operation and weather conditions. They will then get second party confirmation from their Quartermaster before activating the canon. • Friday before the event: Arrival, set up camp. • Sunday: Stage the 12 fire cannons, tie down and secure. Test. • Monday at noon the first hour begins with a 12 cannon show. Each hour after that through 9pm on the night of the burn, one cannon is fired at the appropriate o’clock position, and all twelve at noon and midnight for a total of 61 hourly events barring weather or other safety issues. Safe operation of the canons will be the highest priority. We will never operate a canon if the conditions make it unsafe. We will take all possible precautions by keeping the sawdust secure and enclosed when not in use and away from the canons. The operation of the canons will require several crewmember's agreement, and they will be operated from a safe distance only after a secure perimeter has been established. Cleanup for each position will be done by its Hourteam members. It will entail burning off of any excess sawdust either in the cannons on Sunday evening, or burning it on a burn platform (also happy to coordinate this with another event). We will rake all decomposed granite (used to protect the playa at each canon) from around the site into a pile for Burning Man pickup. The cannons will be loaded on a truck for transportation back to the Bay Area, and any work areas cleaned up to the leave no trace standards we are all familiar with.